Last year: Tuley-Tillman was a senior in high school. I gave him a TTB Rating of 75. Tuley-Tillman was part of the huge run on prospects committing to Michigan in February 2012. He graduated from high school in December, played in the Under Armour All-America Game, and enrolled at Michigan in January. He reportedly reached 330 lbs. at one point, but he was listed at 285 lbs. on the spring roster. And despite being listed at 6'7", he looked shorter than the 6'6" Ben Braden during the spring game. Regardless, he did not play particularly well during the all-star game, and he was a third-stringer in the spring. Technique is constantly mentioned as a weakness, so it may take a few years before he realizes his potential. Personally, I took a lot of heat for suggesting that he did not receive quality offensive line coaching as a high schooler. His high school team promptly went winless in the 2012 season and numerous analysts mentioned how raw he is as a prospect because of technical deficiencies. However, he does have a nasty streak and some good athleticism, so it all depends on how quickly he learns the ins and outs of major college football. Projection: Running back. Ballage is ranked as an athlete, and some people have suggested that he could play outside linebacker in college. However, I think he lacks the instincts and physicality to play linebacker at the next level. He looks like an offensive player, most likely a running back, but perhaps a wideout if he works a little more on his catching skills. He does not seem to be a particularly physical runner, but he's big and strong enough to break arm tackles; if he gets into the open field, he could be very dangerous. Likelihood of committing to Michigan: Ballage has expressed fairly strong interest in Michigan, but he seems to be pretty wide open right now. The in-state schools don't seem to be much of a threat, but he's high on schools like Arizona State, Nebraska, and Oregon, the last of which has not offered yet. It looks to be a long road between now and a commitment. Highlights are available on Hudl. Last year: Dawson was a senior in high school. I gave him a TTB Rating of 71. Dawson's recruitment was probably the most dramatic of Michigan's class of 2013. 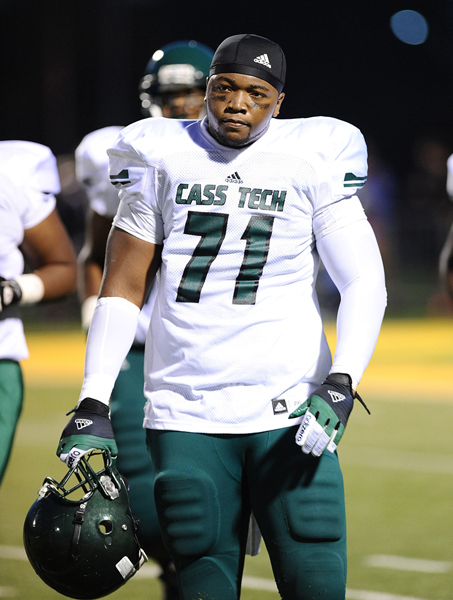 For a little while, some Michigan fans were wringing their hands because the Wolverines hadn't offered the Cass Tech lineman with some significant BCS offers. When the offer finally came, Dawson committed in February 2012. Then he spent the summer months entertaining trips elsewhere, which is a no-no to Michigan's staff. A trip to Florida seemed to seal Dawson's departure from the class . . . but then he re-committed to the Wolverines in December. "The Policy" became "The Policy?" and now nobody knows how Brady Hoke and Co. will handle future recruits who want to visit elsewhere. On the field, Dawson had enough success to be ESPN's top-ranked guard and participate in the Under Armour All-America Game. He played tackle in high school but looks like a college offensive guard. There's not a whole lot of experience at the interior positions, but there is a little bit of depth. 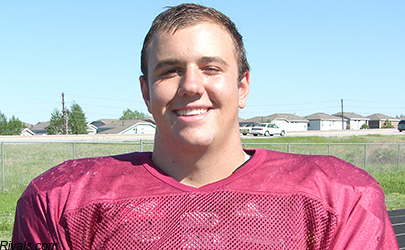 Like most freshman offensive linemen, Dawson is expected to bide his time until at least 2014. 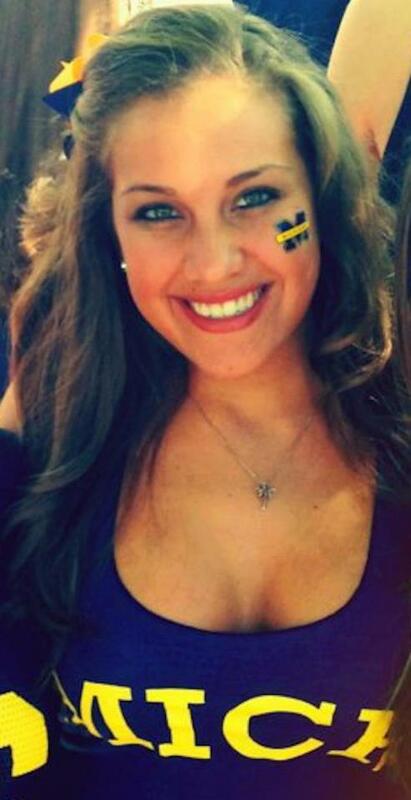 Last year: Samuelson was a senior in high school. I gave him a TTB Rating of 59. Samuelson was once committed to Pitt. Then Nebraska. Then Michigan. If his measurements were accurate coming out of high school, he has the size to be an early impact player. However, he lacks experience in a pro-style blocking system and some refinement when it comes to both run and pass blocking. As you might have discovered via my TTB Ratings, I think Samuelson is the least talented of Michigan's six incoming freshman linemen, but he does have some potential. Since freshman linemen usually redshirt, I think it's very likely that he stays on the sideline this year. Paul Myerberg, who used to write the website Pre-Snap Read, is now doing his countdown for USA Today. Here's the preview for the Fighting Illini. Pictures of attractive girls may or may not appear below the jump. Last year: Fox was a senior in high school. I gave him a TTB Rating of 85. Perhaps the state of Colorado's best player, Fox committed to Michigan in February 2012. Michigan recruited him as a right tackle, but he could also potentially play guard. He accepted an invitation to play in the U.S. Army All-American Bowl, but Fox tore his ACL at the end of his senior season, which meant he was unable to participate in the bowl game. Because of that injury, the loss of time to prepare for football, and the fact that freshmen usually redshirt, anyway, it's very unlikely that Fox sees the field this year. Paul Myerberg, who used to write the website Pre-Snap Read, is now doing his college football countdown for USA Today. Here's his preview for the Akron Zips. There may or may not be pretty ladies after the jump. Last year: Sypniewski was a senior in high school. The story about the recruitment of Sypniewski was an odd one. In the midst of putting together a highly rated recruiting class, the coaches offered and received a commitment from a long snapper. Nobody really knew whether he was being offered a guaranteed scholarship or a preferred walk-on spot, and as a long snapper, he seems to be the forgotten recruit of the class. It appears to have been a legitimate scholarship offer, so the coaches must think that he can get the job done for the better part of the next five years. In case you don't remember the story of Taybor Pepper, by the way, let me refresh your memory: Pepper was a preferred walk-on long snapper in the 2012 class who was "committed" to become a Wolverine; well after National Signing Day 2012, he accepted a scholarship to play for the Michigan State Spartans. Sypniewski represents Michigan's more aggressive approach to recruiting long snappers, who are usually walk-ons that might earn a scholarship if they win the starting job. The reason Sypniewski is all the way down here at #94 is that Michigan has a returning long snapper in the form of fifth year senior Jareth Glanda. Glanda has done a good job as a short snapper and long snapper over the past couple seasons, and he even caught that miracle pass against Virginia Tech in the Sugar Bowl. Long snappers who catch passes are a pretty rare commodity, so we can probably expect Sypniewski to stare slack-jawed from the sideline as Glanda's greatness unleashes itself. Paramus (NJ) Catholic cornerback Jabrill Peppers committed to Michigan. Jacksonville (FL) Raines cornerback Lamont Simmons was offered by Michigan. Simmons is a 6'2", 185 lb. corner with offers from Arkansas, Georgia, and Wisconsin, among others. I can't find much information about him, so feel free to comment with any insight you can. Bamberg (SC) Erhardt defensive end LaSamuel Davis was offered by Michigan. He's a 6'4", 205 lb. prospect with offers from Arizona, Arizona State, UCLA, and USC, among others. Michigan has pursued several guys out of Erhardt in recent years (2014 ATH Kevin Crosby, 2012 DE Martin Aiken, 2011 RB Demetrius Williams), but so far the pursuit has been unsuccessful. Jacksonville (FL) Trinity Christian linebacker Jeff Holland has been offered by Michigan. He's a 6'2", 230 lb. prospect with offers from Alabama, Florida, Florida State, Georgia, Ohio State, and lots of others. According to 247 Sports - the only service to release rankings for 2015 prospects - Holland is the #17 overall player and #1 linebacker in the nation. Michigan also recruited 2011 RB Andrew Buie (West Virginia) and 2010 S Rashad Knight (Rutgers) out of Trinity Christian, but those offers were from the Rich Rodriguez era. Bellflower (CA) St. John Bosco quarterback Josh Rosen was offered by Michigan. Rosen is a 6'4", 200 lb. passer who claims a 4.55 forty. As a sophomore in 2012, he had 2,087 passing yards, 22 touchdowns, 8 interceptions, and 352 rushing yards, which has earned him offers from Oregon State, Tennessee, and a few other schools so far. 247 Sports has ranked him as the #2 pro-style quarterback and the #5 overall player in the nation. He is thought to favor some West Coast, Pac-12 schools, so Michigan will be in an uphill battle to capture his commitment. That may be the reason why the Wolverines went ahead and offered him, despite the fact that they offered 2014 quarterback commit Wilton Speight on National Signing Day 2013. Previously, La Mirada (CA) La Mirada's Kevin Dillman was presumed to be Michigan's top target at the position, and he may well be offered if Rosen ends up committing to Cal or Stanford. Jacksonville (FL) Trinity Christian cornerback Kevin Toliver II was also offered by Michigan. The teammate of Holland, he's a 6'2", 183 lb. prospect with offers from Alabama, Florida, Florida State, and lots of others . . . including LSU, to which he's already committed. 247 Sports ranks him as the #1 cornerback and #33 overall player in the country. Dallas (TX) Skyline linebacker Anthony Wheeler was offered by Michigan. He's a 6'2", 225 lb. prospect with offers from Michigan State, Texas, and Texas Tech, among others. Texas is thought to be the leader, although he's giving other schools a chance. I believe Wheeler will end up as a weakside end because he's a little too stiff and slow to play linebacker at the next level. Fort Lauderdale (FL) University School wide receiver Sam Bruce was offered by Michigan. He's a 5'8", 160 lb. prospect with offers from Arkansas, Clemson, and USC, among others. His uncle is former St. Louis Rams wide receiver Isaac Bruce, who played his college ball at Memphis State; I think it's safe to say that Sam won't be following in his uncle's footsteps when it comes to picking a college. Michigan has really hit the University School hard with offers lately, going after 2013 WR Jordan Cunningham (Vanderbilt) and DT Maquedius Bain (LSU). Bruce is a speedy pinball of a player who could end up as a wideout, corner, nickel corner, or returner at the next level. Downers Grove (IL) South offensive tackle Erik Swenson was offered by Michigan. Swenson was on my 2016 list for a long time, but I removed him several weeks ago because there was some question about whether his offer was "official" or not (even though officially official offers can't be extended until the August prior to his senior year). Now his unofficially official offer has been confirmed, so I'm adding him to the list again. Swenson seems very interested in Michigan, and it probably wouldn't be a stretch to position the Wolverines as his #1 choice. However, he also has offers from Illinois, Notre Dame, and Ohio State, and lots more are sure to come. The 6'6", 280 lb. prospect already has great size, pretty good feet, and solid technique, and he's just a rising sophomore. Akron (OH) St. Vincent-St. Mary's linebacker Dante Booker, Jr. committed to Ohio State. He was always considered to be an Ohio State lean but was very quiet about his recruitment. This might open the door a little bit for Clairton (PA) Thomas Jefferson linebacker Chase Winovich to commit to Michigan over Ohio State, but the last time I made a similar statement (when Sam Hubbard picked the Buckeyes), Kyle Berger went ahead and chose them, too. I guess they're all in a race to be the next Andy Katzenmoyer. Paramus (NJ) Catholic cornerback Jabrill Peppers committed to Michigan today. He chose the Wolverines over offers from Alabama, Florida, Notre Dame, Ohio State, USC, and numerous others. I posted a scouting report on Peppers last Thursday, so you can go there to find a good deal of relevant analysis. As a junior in 2012, Peppers had 172 carries for 1,552 yards (9.0 yards/carry) and 18 touchdowns; he also caught 20 passes for 337 yards (16.9 yards/catch). And on defense, he had 77 tackles, 2 tackles for loss, 1 sack, and 3 interceptions. You can see from the scouting report that I really like Peppers's game. He is one of the top few prospects in the country - if not the absolute best - and looks to me like the top cornerback in the nation. He plays safety for the Paladins, so transitioning to college cornerback might take a little work. But the physical talent and coordination are sufficient for bumping to corner. Lots of high schools will put their best player at safety so he can affect the whole field, rather than putting him on one side and letting the opponent run or throw away from him. As for his role at Michigan, he will presumably arrive in 2014 when starting corners Raymon Taylor and Blake Countess are a senior and a redshirt junior, respectively; the projected free safety will be junior returning starter Jarrod Wilson. A spot should be open at strong safety, which is where current freshman Dymonte Thomas projects to play once Thomas Gordon graduates after the 2013 season. So once Thomas bumps from his current spot at nickel corner to strong safety, that could open the door for Peppers to start as a freshman and then move into a starting cornerback position as a sophomore in 2015. As evidenced by his highlights and those statistics above, Peppers could make an impact in numerous ways. The coaches have told him that they might use him in some packages on offense (presumably at wide receiver), and he could also help the team as a punt/kickoff returner. When talking about Peppers, comparisons to Charles Woodson - Michigan's cornerback/receiver/returner who won the 1997 Heisman - abound. Peppers is the tenth member of the 2014 class, which is expected to be no larger than twenty players strong. He is also the first defensive back of a projected three; Michigan probably wants one more cornerback and a safety. Michigan has recruited New Jersey heavily in recent years, but results have been mixed in the Garden State. Peppers's teammate Juwann Bushell-Beatty is an offensive tackle who committed to Michigan a few weeks ago, but before that the last few players from that state were linebacker J.B. Fitzgerald, safety/linebacker Brandon Smith, and defensive end Anthony Lalota; Fitzgerald lasted all four years but was never more than a backup, and Smith (Temple) and Lalota (Rutgers) transferred before quitting football altogether. This is the first time I've given a . . . The only picture of Will Hagerup that really matters: the one with Erin Andrews. Last year: I ranked Hagerup #51 and said he would be the starting punter. He punted 33 times for 1,486 yards (45.0 yards/punt), 4 touchbacks, 4 fair catches, 3 punts inside the 20-yard line, 13 punts of 50+ yards, and a long of 62. If you want to shake your head and/or laugh, click on that profile from last year's countdown. Much of the discussion was about whether he would get suspended or not (note: he was indeed suspended for the Outback Bowl against South Carolina). But before the perennial suspension occurred, he kicked well enough to be the Big Ten's best punter. In some respects, it was even better than his outstanding freshman year. When he was on the field, he was very reliable. Unfortunately for everyone involved, the suspension for the bowl game shows a habitual disregard for the rules, and Brady Hoke instituted the Darryl Stonum Fifth Year Clause, which suspends Hagerup for the entirety of the 2013 season in an effort to clean up his act. If he avoids troublesome issues (alleged to be marijuana), then he can return as a fifth year senior in 2014. If he reverts to his old ways, he might find himself playing at a community college in Wisconsin. For the sake of everyone, hopefully he finds a new path. Where will Jake Ryan end up on the list? The annual season countdown begins tomorrow morning. In case you're new to the blog, I profile one player per day from the least important to the most. For example, a player who is likely to redshirt will probably be very low on the list; the player Michigan can least afford to lose will be #1 on the list; a good player with a quality backup or two might get bumped down the list, since losing him might not impact the team in a significant way. Remember that this will not be a list of the best players, but the most important players. You can see the 2012 Season Countdown here, along with the 2011 Countdown, the 2010 Countdown, and the 2009 Countdown. Projection: Cornerback. Peppers has the speed and change of direction skills to play cornerback at the next level, but if a team needs a safety, running back, wide receiver, or returner, he could do all of those things. I think he is the best cornerback prospect in the 2014 class. With some refinement possibly needed in coverage technique, he may struggle a little bit initially; but his kind of coordination and reported dedication to training should correct that quickly. He could be an All-American by his sophomore year. Reminds me of: Reggie Bush. I know this is an odd choice because Bush was/is a running back, but Peppers has the same kind of dynamic ability to change direction, outrun people, return kicks/punts, etc. There aren't many cornerbacks who play with the same kind of physicality that Peppers has, so finding a comparison is difficult. If you make me choose a cornerback, I'll go a little ways back and say Aeneas Williams, the borderline Hall of Famer from the Arizona Cardinals. Likelihood of committing to Michigan: The popular belief is that Peppers, who has scheduled an announcement for this coming Sunday, will commit to Michigan. Others in the running have been Penn State and Stanford, but the Wolverines appear to be the front-runners. 247 Sports released its top 247 players for the 2015 class, and here are some notable players from around the country. Remember that these kids are finishing up their sophomore year of high school, so there's a long way to go, new names will pop up, etc. 1. Canton Kaumatule - DE - Hawaii: He's, like, #1. 2. Terry Beckner, Jr. - DE - Illinois: Offered. 5. Josh Rosen - QB - California: Offered. 12. Kevin Dillman - QB - California: Previously presumed to be Michigan's top QB target, teammate of 2014 TE Tyler Luatua. 16. George Campbell - WR - Florida: Offered. Teammate of 2014 OG commit Mason Cole and WR Artavis Scott. 18. Jason Cornell - DE - Minnesota: Offered. 23. Soso Jamabo - RB - Texas: Offered. 25. Jaason Lewis - ATH - Virginia: Offered. 27. Shy Tuttle - DT - North Carolina: Offered. 30. Jordan Scarlett - RB - Florida: Teammate of 2016 WR offeree Sam Bruce. 37. Minkah Fitzpatrick - CB - New Jersey: Teammate of 2014 RB offeree Jonathan Hilliman. 43. Justin Hilliard - LB - Ohio: In-region prospect. 44. John Houston - LB - California: Teammate of 2014 CB Adoree' Jackson and LB Dwight Williams. 47. Malik Jefferson - LB - Texas: Offered. 50. Iman Marshall - CB - California: Teammate of 2014 ATH John Smith. 52. Jerome Baker - LB - Ohio: In-region prospect. 59. Jordan Stevenson - RB - Texas: Teammate of 2015 LB offeree Anthony Wheeler. 63. Marquise Overton - DT - Oklahoma: Teammate of 2014 S Steven Parker. 66. Ricky DeBerry - LB - Virginia: Visited campus last month. 72. Brian Cole - CB - Michigan: Offered. 73. Jahvoni Simmons - LB - Virginia: Teammate of 2015 ATH offeree Jaason Lewis. 74. Larry Scott - RB - Ohio: In-region prospect. 78. Devante Peete - WR - Florida: Teammate of 2014 WR offeree Corey Holmes. 84. Eric Glover-Williams - CB - Ohio: In-region prospect. 86. Sterling Jenkins - OT - Pennsylvania: Offered. 87. Jacques Patrick - RB - Florida: Offered. 88. Cordell Broadus - WR - California: Son of Snoop Dogg/Lion. 90. Damien Harris - RB - Kentucky: Offered. 110. Natereace Strong - RB - Illinois: Teammate of 2015 DE offeree Terry Beckner, Jr.
113. Michael Weber - RB - Michigan: Offered. 130. Elijah Taylor - DT - Ohio: In-region prospect. 149. Shaun Crawford - CB - Ohio: Offered. 153. Hjalte Froholdt - DT - Ohio: Offered. 159. Darian Roseboro - DE - North Carolina: Offered. 163. Chris Green - LB - Ohio: In-region prospect. 171. Kyonta Stallworth - OT - Michigan: In-state prospect. 191. Kahlil McKenzie - DE - Wisconsin: In-region prospect. 192. Osa Masina - LB - Utah: Offered. 193. Malik Roberson - RB - California: Teammate of 2014 CB Adoree' Jackson and LB Dwight Williams. 196. Garrett Thomas - OT - Louisiana: Offered. 216. Josh Alabi - OT - Michigan: Offered. 222. Markell Jones - RB - Indiana: In-region prospect. 225. David Dowell - WR - Ohio: Teammate of 2015 CB offeree Shaun Crawford. 228. Reagon Williams - LB -Ohio: In-region prospect. 233. Jimmy Fitzgerald - QB - Illinois: In-region prospect. 235. Brandon Tiassum - OG - Indiana: In-region prospect. 237. Anthony Wheeler - LB - Texas: Offered. 243. Tyrone Wheatley, Jr. - TE - New York: Offered, son of former Michigan RB Tyrone Wheatley. The Rivals 250 for the class of 2014 was released on Tuesday (the Rivals 100 was released yesterday). Here's what it looked like back in February. 247 Sports released its updated top 247 yesterday. 28. Jalen Tabor - CB - Washington, D.C.
Fifty percent of today's ad revenue and Paypal donations will be donated to the Red Cross for their efforts following the devastating tornado in Moore, Oklahoma. Of course, if you feel like donating directly to the Red Cross, that would be a great thing, too. The Rivals 100 for 2014 was updated today. Here's what the list looked like when it was released in February. 20. Jalen Tabor - CB - Washington, D.C.
Mesquite (TX) Poteet linebacker Malik Jefferson was offered by Michigan. Jefferson is 6'3", 215 lbs., and has offers from Clemson, Ohio State, Oklahoma, Texas, and Texas A&M, among others. As a sophomore in 2012, he had 105 tackles, 24 tackles for loss, 7 sacks, 5 forced fumbles, and 3 fumble recoveries. He also claims a 4.43 forty, a 35" vertical, and a 305 lb. bench press. While he plays linebacker and appears to be recruited as a linebacker, I would not be surprised if he grows into a weakside end prospect. The Longhorns appear to be the leader in his recruitment. Missouri City (TX) Ridge Point linebacker Cameron Townsend was offered by Michigan. He's a 6'0", 195 lb. prospect with offers from Baylor, Houston, and Texas. He plays like a SAM linebacker, but his size indicates more of an inside linebacker prospect. He's a very heavy hitter whose position might become clearer if he hits a growth spurt, but for now, I see him as a MIKE. Nashville (TN) Montgomery Bell offensive tackle Alex Bars committed to Notre Dame. I had written a scouting report on Bars a couple weeks ago and liked what I saw. His older brother Blake plays offensive guard at Michigan, but he has another brother at Penn State and a father who played for the Fighting Irish. Michigan seemed to be the other leading option for Alex, however, and the Wolverines don't have any other offensive linemen who seem heavily interested, although Chandler (AZ) Hamilton's Casey Tucker has voiced interest after decommitting from USC and Florissant (MO) Hazelwood Central's Roderick Johnson visited this spring. Perhaps we will see the coaching staff send out some more offers. East St. Louis (IL) East St. Louis linebacker Kyron Watson committed to Kansas. Watson had been hinting for weeks that he would commit to Michigan as soon as he visited campus, but that visit was postponed a couple times and re-scheduled for this past weekend. Just before the visit, however, Michigan's coaches reportedly told him that he no longer had an offer. There are some rumors that Michigan thought he could play SAM but then backed off once they found out he measured in at a shade under 6'0", but I find that hard to believe; it's clear from his recruiting profiles and his highlights that he's not very tall. I wrote up a scouting report on Clairton (PA) Thomas Jefferson linebacker Chase Winovich. Poll results: Who will be the best linebacker in the 2013 class? There aren't many options for the best linebacker in the 2013 class, but Gedeon wins out here. Gedeon is a 6'3", 220-pounder who finished the recruiting cycle as the #11 inside linebacker and the #214 overall player in 247's Composite Rankings. Also a well rounded offensive player in high school, he was recruited to play the weakside linebacker position; there's also a chance that he could grow into the middle linebacker spot as he ages. McCray is listed at 6'4" in some places, although he measured in at last summer's Rivals 5-star Challenge at just 6'1". He also reportedly weighs 230 lbs. Michigan's coaching staff has mentioned that they see him playing the SAM position this fall, and they surely know his actual height; but height and length are often desirable traits in a SAM, so perhaps McCray won't stay at that position for his entire career. Readers went away from the recruiting sites' line of thinking in this vote, because McCray is considered the #4 athlete and #130 overall player by 247's Composite Rankings. Projection: Outside linebacker. Winovich clearly needs to add bulk to his frame, since he is reed thin and has the lower body of a safety. Although pass coverage is not highlighted in his film, his length and change-of-direction skills should make him at least decent in that area. He has a good nose for the ball and should be plus pass rusher if he can work on using his hands and, of course, add strength and mass to his frame. There is also a slight concern about how much weight he will be able to add without losing his best qualities, which are his quickness and speed. At his height he should end up around 240-250 lbs. by the time he's a college upperclassman. Since there's so much physical development in the works, it's hard to project what kind of athlete he might be; however, I think he could be a BCS all-conference type of player if he can maintain his athleticism. Reminds me of: Shawn Crable. Crable had chicken legs but good length and a very developed upper body; he also had good speed and a knack for getting skinny to avoid blockers and shoot gaps. Likelihood of committing to Michigan: Ohio State and Michigan appear to be the front runners, with Pitt running third. Winovich visited Michigan last weekend and left with positive vibes, but he grew up as a Buckeye fan. A friendship with committed linebacker Michael Ferns III may prove to be beneficial for the Wolverines' chances. You can view Winovich's highlights here. Rising fifth year senior linebacker Mike Jones has left the football program. Already with his undergraduate degree, Jones would be eligible to play at another FBS school in 2013 if they offer a graduate program that Michigan does not offer. Jones committed to Michigan on August 1, 2008, as a part of the 2009 class; he picked Michigan over offers from Auburn, Central Florida, North Carolina, and South Florida. He came from Orlando (FL) Edgewater as part of Rich Rodriguez's attempted raid on the state of Florida, a few years after Lloyd Carr landed wide receiver Greg Mathews from the same school. As purely a special teamer in 2009, Jones made 3 tackles in seven games. He played in just two games as a sophomore before succumbing to injury, totaling just 1 tackle; he received a medical redshirt (which preserved his eligibility for 2013). As a redshirt sophomore in 2011, Jones made 4 tackles. He followed that up by playing in all thirteen games as a redshirt junior in 2012, but he failed to accrue any statistics. Altogether, Jones made 8 total tackles in 29 games. Jones, who claimed a 4.5 forty coming out of high school and was noted for his speed, never seemed physically capable of keeping up with Big Ten athletes. He always seemed a step or two slow, and he didn't have the bulk to be a serious option at middle linebacker - a position where speed isn't required for success. Jones added weight consistently, going from 203 lbs. as a freshman to 226 lbs. this past season, but small-ish linebackers need to be faster than he was. For the past couple off-seasons, I have had a feeling that Jones might not return because I wondered if he would ever find a role; that time finally came. Since Jones was going to run out of eligibility after the coming year, his departure does not affect the 2014 recruiting class. He was also not expected to be on Michigan's two-deep in the fall, having dropped behind younger players at MIKE (junior Desmond Morgan, sophomore Joe Bolden) and WILL (sophomores James Ross and Royce Jenkins-Stone). Jones was also not particularly productive on special teams, so the team likely won't feel much of an impact on the field. For stories on other former Wolverines, check out the Ex-Wolverine Encyclopedia. Rising senior safety Marvin Robinson has left the football program. He will presumably transfer somewhere to finish out his football career, but his destination is unknown at this time. A member of the 2010 recruiting class, the Winter Haven (FL) Lake Region product committed to Michigan in April 2009, choosing the Wolverines over Florida, Georgia, Ohio State, and USC, among others. He was a 4-star and the #20 outside linebacker to Rivals, who thought that he would be too slow and stiff to play safety at the next level. Perhaps they were right. Robinson mostly appeared on special teams as a true freshman and made 3 total tackles. As a sophomore in 2011, he earned a start against Notre Dame, making 7 tackles in that game and 9 on the season; he ended up in the coaches' doghouse and didn't see the field much for the rest of the year. In his junior season, he was once again mainly a contributor on special teams and made 9 tackles and 1 fumble recovery. He finished his Michigan career with 21 tackles and 1 fumble recovery. As you can see in the commitment post linked above, I thought Robinson would be a good college player. However, he did not seem to progress much in his pass coverage. In the past year or so, I had succumbed to the idea that he would be able to help in run support, but not so much on passing downs. Last season he was surpassed on the depth chart by freshman Jarrod Wilson, and it looked like Wilson would be the starting free safety with incumbent FS Thomas Gordon bumping over to the strong safety position. Robinson likely would have been relegated to special teams backup strong safety. Others vying for that backup SS role will be redshirt junior Josh Furman, redshirt freshman Jeremy Clark, and some true freshmen. Robinson is the 17th member of the 27-man class of 2010 to depart early. The only players remaining from that class are DT Richard Ash, CB Courtney Avery, DT Jibreel Black, WR Drew Dileo, Furman, QB Devin Gardner, P Will Hagerup, WR Jeremy Jackson, TE Jordan Paskorz, and LB Jake Ryan. This departure will not affect the size of the 2014 recruiting class, since Robinson was scheduled to run out of eligibility after the upcoming season, anyway. Instead, it opens up a scholarship for a walk-on guy like FB Joey Kerridge, WR Joe Reynolds, etc. Check out the Ex-Wolverine Encyclopedia for stories and updates on other players who left early. 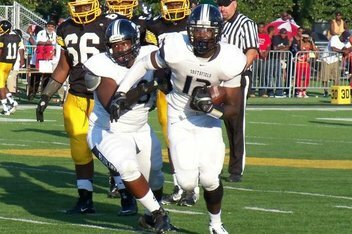 Southfield (MI) Southfield defensive end Lawrence Marshall committed to Michigan. St. Paul (MN) Cretin-Derham Hall defensive end Jashon Cornell was offered by Michigan. Cornell is a 6'4", 230 lb. prospect with offers from Florida, Notre Dame, Ohio State, USC, and Wisconsin, among others. Notre Dame is thought to be the leader because of a couple relatively recent alumni heading to South Bend (WR Michael Floyd, WR James Onwualu), but it's also the alma mater of OT Seantrel Henderson, who first committed to USC before ending up at Miami. As a sophomore in 2012, he had 52 tackles, 26 tackles for loss, 14 sacks, and 3 forced fumbles. 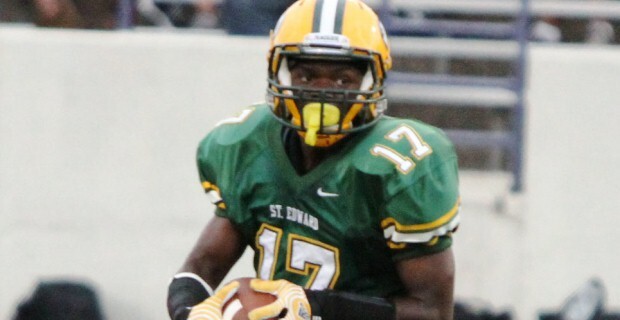 Lakewood (OH) St. Edward cornerback Shaun Crawford was offered by Michigan. He's a 5'9", 170 lb. prospect with offers from Arkansas, Florida State, Miami, Penn State, and Tennessee, among others. As a sophomore in 2012, he had 66 tackles, 3 tackles for loss, 1 sack, 2 interceptions, 3 pass breakups, 2 forced fumbles, and 1 fumble recovery; he also had 24 catches for 438 yards and 5 touchdowns. Warren (OH) Harding defensive end Hjalte Froholdt was offered by Michigan. He's a 6'5", 265 lb. prospect with no other offers at this time. Froholdt grew up in Denmark and played his first season of football in America (though he played the sport in Denmark, too) as a sophomore last season. Harding is the alma mater of former Michigan wide receiver Mario Manningham, linebacker Prescott Burgess, and linebacker Carl Diggs, as well as a couple recent Michigan signees who flamed out (LB Davion Rogers, WR D.J. Williamson). Upper Marlboro (MD) Wise safety Marcus Allen committed to Penn State. In case you're wondering, I can find no indication that he's related to the Marcus Allen . . . you know, the one who ran for over 2,300 yards in one season at USC, won the Heisman, and was the second best Los Angeles Raiders running back in Tecmo Bowl. The younger, unrelated Allen never showed significant interest in Michigan. Here's a list of the visitors from this past weekend. 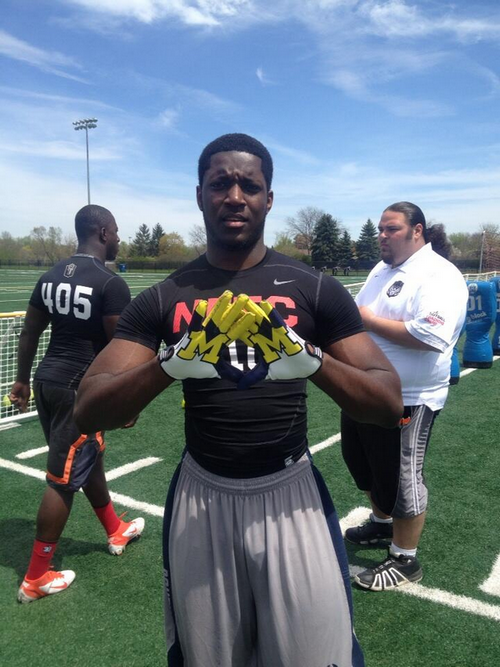 Southfield (MI) Southfield defensive end Lawrence Marshall committed to Michigan on Saturday morning. He chose the Wolverines over offers from Michigan State, Notre Dame, Ohio State, and Oklahoma, among others. I wrote up a scouting report on him just . . . uh . . . yesterday. That has pretty much all the information you might need. As I mentioned in said scouting report, Marshall looks like a guy who could start off at weakside end as a youngster and eventually bulk up into being a strongside end. In my opinion, he's not an elite pass rusher, and he lacks a variety of moves that would help him circumvent college left tackles. Those pass rush moves can be taught, however, and Marshall does have decent athleticism and pretty good straight line speed. People have asked me if I think he can add enough weight to play on the strong side, but current starting weakside end Frank Clark came in at about 6'2" and 215 lbs. and is now almost 280 lbs. ; Marshall will be coming out of high school 10-20 lbs. heavier than Clark did and with an added inch or two in height. You can see that I have some questions about Marshall, and there's also evidence that kids who change their commitments during the recruiting process often struggle to find success at the next level. Maturity and level of commitment come into play when talking about kids who make such big decisions rashly. Hopefully, for Marshall and Michigan's sake, he breaks that trend. In the above linked scouting report, I made comparisons to Craig Roh - who started off at WDE before bulking up to SDE - and Tim Jamison, who remained at WDE throughout his career. Jamison was a better athlete than Marshall coming out of high school, but the weight he added in college seemed to slow him down just enough to prevent him from becoming a top-notch player. However, Jamison has been a fringe NFL player, and Roh signed with the Carolina Panthers as an undrafted free agent, so following in their footsteps would be a pretty decent achievement. Marshall is the ninth commitment in a class that is probably going to be in the upper teens or maybe even reach twenty, so we're about halfway home. Michigan is also looking to take at least a couple defensive ends in the 2014 class, with guys like Detroit (MI) Loyola's Malik McDowell and Woodbridge (VA) Woodbridge's Da'Shawn Hand still on the board. The only other defensive lineman currently committed is Salt Lake City (UT) Highland's Bryan Mone, a defensive tackle. Jerome Baker - ATH - Cleveland (OH) Benedictine: Baker is a 6'1", 205 lb. prospect with offers from Florida, Ohio State, Penn State, and Tennessee, among others. He also claims a 4.52 forty, which is impressive for a rising junior of his size. The class of 2015 prospect does not yet have a Michigan offer, but he will probably get one on the visit. Baker plays running back and linebacker for Benediction, but he looks most like an inside linebacker (MIKE or WILL) from Michigan's eyes. UPDATE: Baker is no longer visiting this weekend. Michael Ferns III - LB - St. Clairsville (OH) St. Clairsville: Ferns committed to Michigan last August. 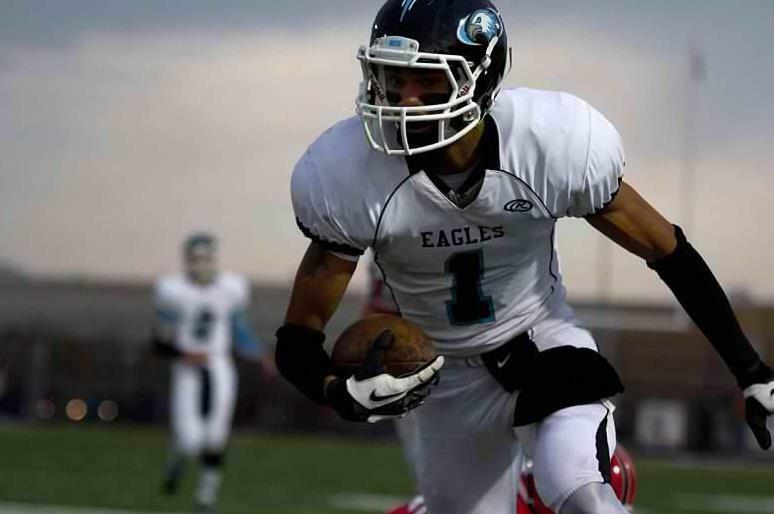 He recently accepted an invitation to play in the 2014 Under Armour All-American Game. Drake Harris - WR - Grand Rapids (MI) Christian: Harris committed to Michigan last month. He was recently invited to Nike's The Opening and will also play in the Under Armour game. 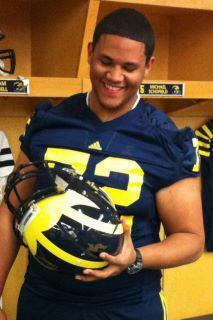 Lawrence Marshall - DE - Southfield (MI) Southfield: Marshall is a 6'4", 225 lb. prospect with offers from Michigan, Michigan State, Nebraska, Ohio State, Oklahoma, and Tennessee, among others. He committed to Ohio State for a couple days, but he's no longer considering the Buckeyes. He recently announced a top five of Michigan, Michigan State, Notre Dame, Oklahoma, and USC, but most analysts think MSU leads with Michigan a step behind. Wilton Speight - QB - Richmond (VA) Collegiate: Speight committed to Michigan in February. He, too, will play in the Under Armour game. Maurice Ways - WR - Detroit (MI) Country Day: Ways committed to Michigan last month. Chase Winovich - LB - Clairton (PA) Thomas Jefferson: Winovich is a 6'4", 215 lb. prospect with offers from Florida State, Miami, Michigan, Ohio State, and Pitt, among others. He claims a 4.65 forty and checks in on 247's Composite ranking as a 3-star, the #41 OLB, and the #551 player overall. Winovich was offered by the Wolverines in early April, immediately after a couple other SAM prospects (Kyle Berger, Sam Hubbard) committed to Ohio State. He visited Michigan last fall and shortly after being offered last month, so this will be his third visit in the last seven months. Ohio State and Pitt appear to be the two biggest contenders, along with Michigan. For those of you who are concerned about things being safe for work, the following picture is decidedly NOT safe for work. Do not click through if you're at work or if there are people who would be offended lingering behind you. Projection: Strongside end. Marshall is a good athlete, but he's not outstanding in any facet of the game. He gets off the ball and shows good straight line speed, but he lacks some refinement, and he's not helped by the quality of his opponents. He does make some plays against a quality-coached opponent in Farmington Hills (MI) Harrison, but even in that game, he was unblocked on too many plays; other teams just don't pay any attention to him and allow him to slice in for uncontested sacks, tackles for loss, etc. Rather than being Lawrence Marshall highlights, these seem like Southfield opponents' lowlights. Technique can be improved, but I think a lack of explosiveness and change-of-direction skills might be an issue as a weakside defensive end. Marshall seems like a decent FBS player, but not a future superstar. Reminds me of: Craig Roh. Roh was a good high school athlete who was able to blow past high school offensive tackles at times, but he also struggled to rush the passer because of an inability to change direction well. Roh used his hands better as a prep, and he was eventually a very technical player with limited athletic ability. Likelihood of committing to Michigan: Marshall was committed to Ohio State at one time, but they have since been eliminated from contention. Several insiders think that Michigan State is the leader for his services, but Michigan seems to be right behind; if things fall through with the Spartans, the Wolverines might be next in line to contend for his commitment. Getting to know Maurice Hurst, Jr.
Westwood (MA) Xaverian Brothers defensive tackle Maurice Hurst, Jr is a high-intensity player that the Michigan coaches are going to love to work with. The athletic defensive tackle plays with a lot of energy and a great motor. With his passion for the game and willingness to serve his community and help others, Maurice Hurst, Jr. has Michigan man written all over him. He kindly took the time out of his preparation and busy schedule to answer a few questions about becoming a Wolverine. Can you elaborate on your decision of become a Wolverine, what stood out the most about Michigan, and what was your deciding factor? Have the coaches discussed contributing next year, and do you have a preference in redshirting or not? How has your father's experience in college and the NFL helped you with your path to becoming a collegiate athlete? Have the coaches discussed a playing weight for you, and where are you most comfortable? Is there a game on the schedule next year that you have circled? We saw the moves on your highlight tape. Any dreams of a goal line fullback package at Michigan? Any idea of who you will be rooming with when you arrive at Ann Arbor? Do you have any pregame superstitions? Meal of choice the night before the game? Labels: interviews, Maurice Hurst Jr.